This mesmerizing temple is considered one of the most terrific sites to visit in Egypt. It is known for its sound & Light festival at night, so it attracts many tourists from different parts of the world. It is known as the Temple of Isis and it features in practically all good quality Nile cruise holidays. Philae Temple was built in 690 BC and it is considered the last of the ancient temples constructed in the classical Egyptian style. It serves as an amazing example of the cult that was built around her story that includes Osiris and Horus it was dedicated to goddess Isis. Osiris was buried on the Philae Island where the temple stood so it is the most sacred temple among the whole ones by both Egyptians and Nubians. Inside the temple, you find the birth house, which was dedicated to Hathor & Isis to honor their son Horus. There are eight columns separated from the court by screens in addition to many Coptic crosses and Greek inscriptions are found inside the first room of the temple. There is an inscription that commemorates the archeological expedition that was sent in 1841 to Philae above the door of the temple. When the low dam was constructed in Aswan, the rising water of Lake Nasser inundated Philae Island in addition to threatening Philae temple. The height of the dam raised twice from 1907:1912 and from 1929:1934. The temple was going to be completely lost because of the construction of the High Dam. The temples had to be relocated, piece-by-piece, to nearby islands, such as Bigeh or Elephantine. That is why the UNESCO established a huge project to save the temple and move it to higher ground near Agilkia Island. Although the buildings were physically secure, the island’s attractive vegetation and the colors of the reliefs of the temple were washed away. 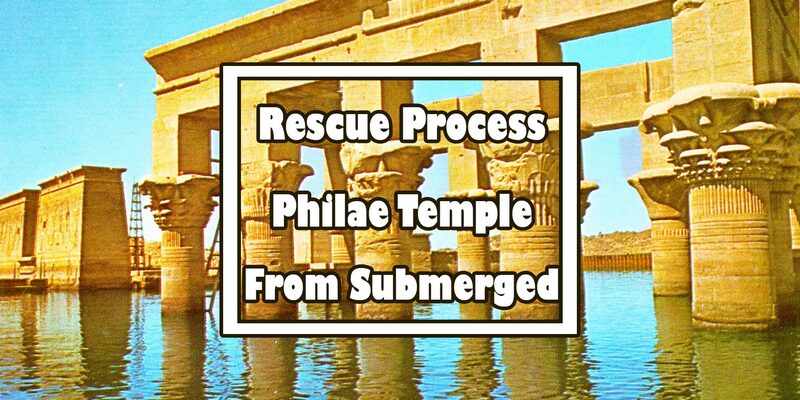 In addition, the bricks of the Philae temples soon became encrusted with silt and other debris carried by the Nile. Today, when we see the complex stands like this, one must wonder how it was moved & reconstructed to be that famous tourist attraction. This achievement truly makes the site worth the visit, so you can enjoy a magical tour to Egypt and visit Philae temple in addition to witnessing amazing archaeological sites in ancient Egypt through our Egypt tour packages.